Air West Airlines (WU) started as a regional contract cargo airline called Westpac, based in Long Beach, California. Hoping to tap into the growing gambling market in Laughlin, Nevada, Air West Airlines was developed to provide service into the Laughlin/Bullhead City Airport located along the Colorado River in the far southern portion of Nevada. The new airline acquired two Metroliners in 1991, and started charter service to Laughlin from Long Beach, Los Angeles, Burbank, Ontario, and San Diego during the fall of 1992. 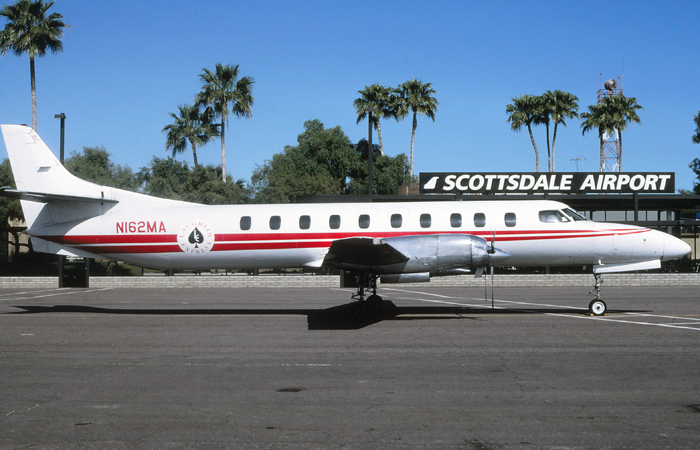 By January 1993, the airline had started scheduled passenger services to the pervious cities under the new name “Laughlin Express,” and added Phoenix-Scottsdale Airport, as well as Tucson to its destinations from Laughlin. Into the spring of 1993, Laughlin Express added Bakersfield and Bermuda Dunes (Palm Spring) to its route map, however dropped service to Tucson. Although one of the only carriers providing service into Laughlin-Bullhead City, the airline suffered from continual losses and low passenger loads, resulting in Laughlin Express suspending operations in June 1993, having been in service for only six months. 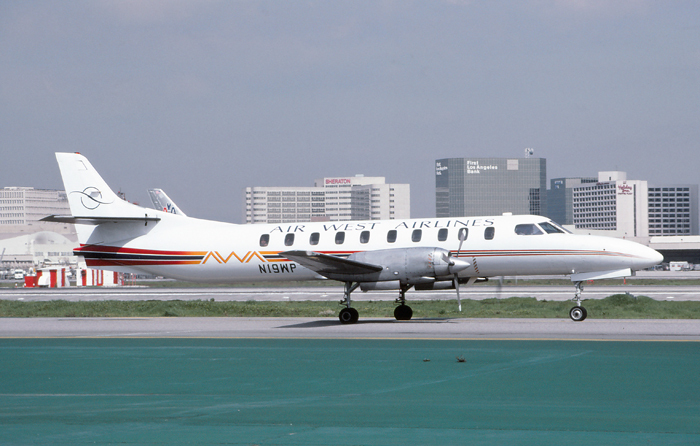 The airline continued to operate cargo charter flights with a sole Metroliner under Air West Airlines until the carrier finally suspended all operations in June 1994. 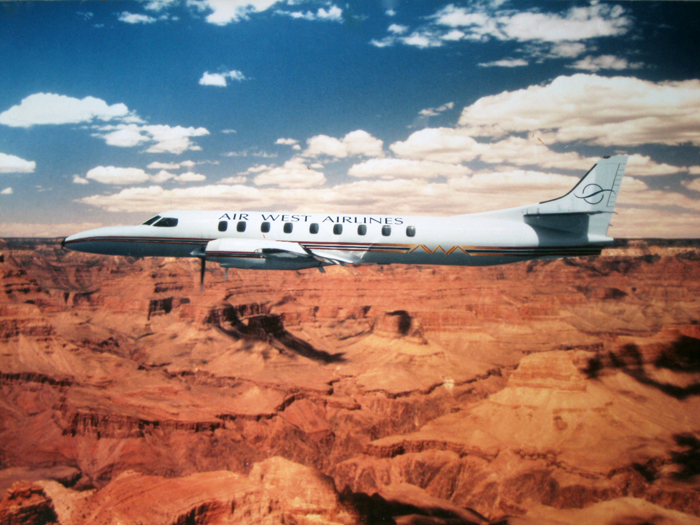 A retouched photo showing an Air West Airlines Metroliner over the Grand Canyon used to promote new service across the Southwest into Laughlin, Nevada. Charter services to Laughlin-Bullhead City were provided to Los Angeles International Airport via the Imperial Terminal. Taxiing outbound along Taxiway Foxtrot for a mid-morning departure in February 1992, is N19WP, a Fairchild-Swearingen SA-226TC Metro II, leased by Air West Airlines in October 1991. Laughlin Express's Metro parked and getting ready to start the engines and depart from Scottsdale Airport, north of Phoenix in April 1993, is N162MA, a Fairchild-Swearingen SA-226TC Metro II, originally delivered to Midstate Airlines in June 1977, and leased by Air West Airlines in October 1992. After the demise of "Laughlin Express," Air West Airlines continued to provide charter cargo services until June 1994. 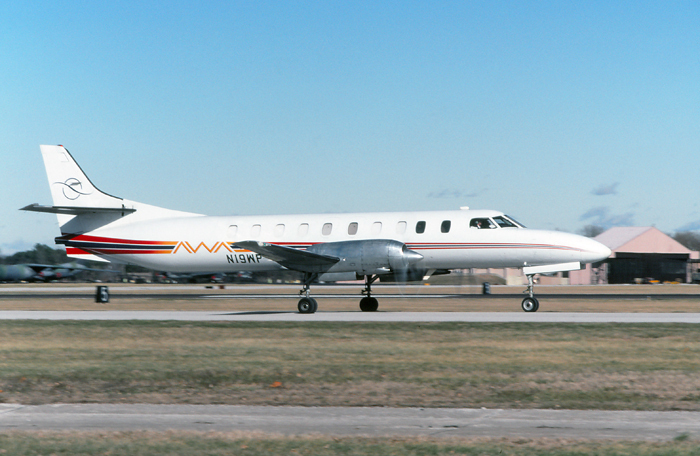 On its takeoff roll at Scott Air Force Base, Illinois, and operating a cargo flight in December 1993, is N19WP, a Fairchild-Swearingen SA-226TC Metro II.